As British manufacturers of fire fighting equipment, FireBug push the boundaries of accepted practices and traditional products. Specialising in the supply of unique, patented fire fighting nozzles, FireBug is committed to the research and development of disruptive technologies for the fire fighting industry. See our MistNozzle range of products. 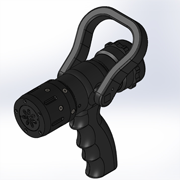 MistNozzle; a leading product in the revolution of fire fighting technology. Designed to be intuitive, the MistNozzle has one-click switch-function technology, allowing the transition between Jet Mode and WaterMist Mode to be instantaneous and easy, minimising room for error and ensuring safe mode selection. Available in two sizes, the MistNozzle Mini and MistNozzle Maxi ensure you have powerful water misting technology at hand. Fire fighting nozzle manufactured in the UK by FireBug, offers water mist technology for modern fire fighting in a branch form. MistNozzle Mini is a small yet versatile mist and jet nozzle available for portable fire fighting.